Taking place every four years, ITEAC is regarded as the place to be if you are involved in the planning, design, construction, specification or operation of places of entertainment. This year’s theme was Places for Performance: New Directions and aimed to explore new ways in which performance spaces are developing. As one of the sponsors, we were there all three days at this year’s ITEAC and WL’s Managing Director Bryan Raven has written a blog focusing on his time there. As I walked up to the IET at Savoy Place early Sunday morning*, there was a real sense of anticipation. 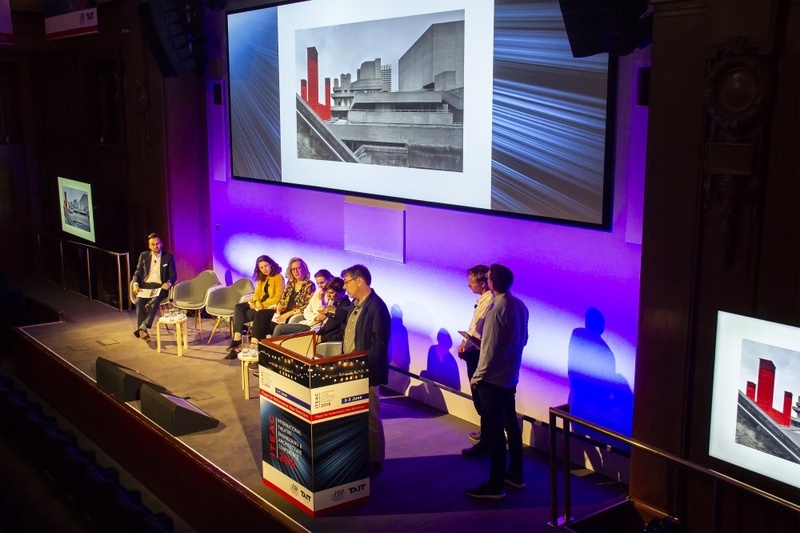 As ITEAC only takes place once every four years, it is always a hugely popular event and attended by delegates from around the world who are involved in theatre architecture. We were delighted to not only be a sponsor this year but also have our staff give presentations along with two of our apprentices helping with the technical set up including the get in (*they had to be on site at 6am Sunday…I was a bit later!). After catching up with old friends and clients, the day kicked off with a fascinating sessions entitled ‘New Cities, Countries and Opportunities’. 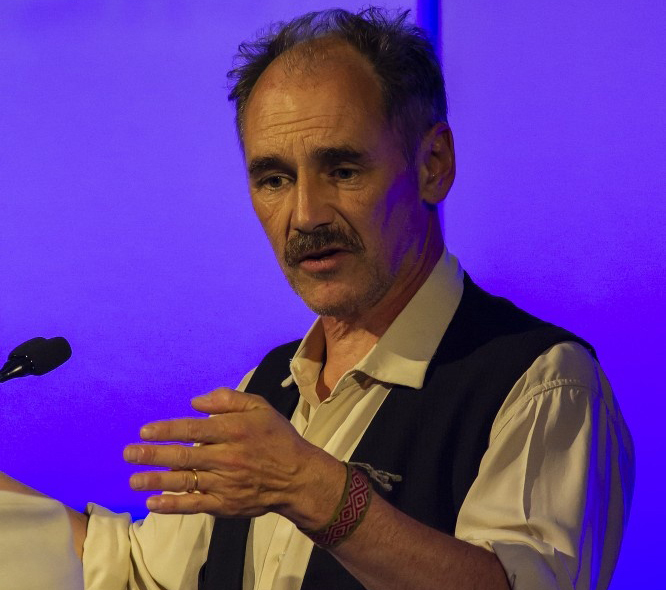 Later that afternoon, we were treated to Oscar-winning actor Mark Rylance offer his own unique interpretation of theatre buildings; sentiments you rarely hear from an actor. One thing that really struck a chord with me was his comment that ‘silence for actors is the same as darkness for lighting designers’ – as part of his plea for quieter technology. After lunch, I relocated upstairs to the Turing Lecture Theatre where I heard our Technical Solutions Director, Andy Hook, speak as part of ‘The Use of Digital Technologies to Enhance Performance’ session. Andy expressed his belief of how augmented reality is the future and spoke at length about our recent immersive production open day at WL which was a huge success and pushed the boundaries of broadcast technology (you can see a full demonstration of the concept here). The day was rounded off by a trip to the newly-opened Bridge Theatre over near Tower Bridge (where we supplied some of the lighting infrastructure and LED house lights). 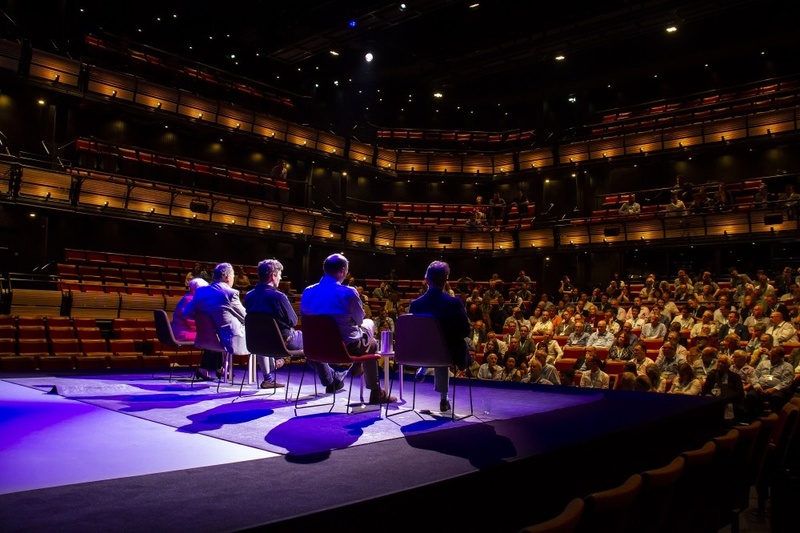 Not only were delegates able to walk around this fantastic venue but they also heard a panel discussion chaired by Dr Margaret Shewring which featured the theatre’s co-founder Nick Starr along with our good friend Mark Ager from Tait, who discussed his vision for the space. Monday proved just to be as busy as Sunday; if not more so. It was another jam-packed day and, like all of the other delegates, I tried my hardest to attend as much as I could. Particular highlights included Lucy Kerbel, the Artistic Director of Tonic Theatre of which we are a sponsor, who chaired two equally fascinating panels: Artistic Directors Perspective with Louise Jeffreys and Bodies in Space, alongside Vicki Igbokwe. 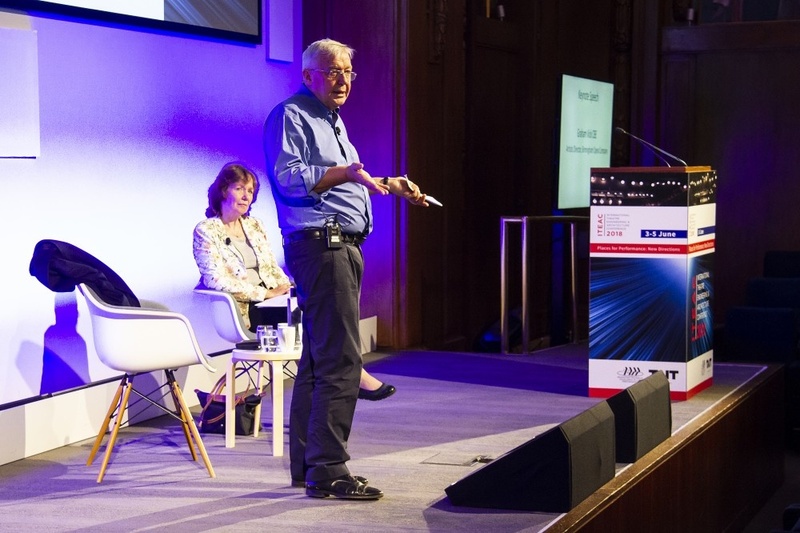 It was great hearing an old friend of WL, Rob Halliday, speak so passionately about the Eco Design regulations as part of the Bursting the Bubble: LED, Regulation and the Future of Lighting debate, which was moderated by LD Lucy Carter. The day thought up a few interesting topics, including two separate references to how important the seating in venues was to sightlines. There was also a debate about a standard for motion control with companies like Tait & Kinesys discussing the merits. The lighting world agreed a standard protocol in the mid eithers (DMX512) and it was great to have Steve Terry from ETC in the room who was one of the main people behind DMX. The final day of ITEAC – where did the past three days go?! Thankfully, today proved as interesting and innovative as the others. It started with a fantastic key note speech by Graham Vick MBE who spoke about the sometimes negative impact venues can have on new audiences and how it’s about going out and taking the work to them – something he’s done to great effect with Birmingham Opera. Another controversial comment came from theatre critic Lyn Gardner who asked if we actually need new theatres as part of the ‘Core Values in Theatre Architecture’ discussion. Lyn also made a great point of how ‘it’s important for buildings to have a connection with the local community – they should feel an attachment to them’. Upstairs in the Turing Lecture Theatre was another insightful debate called ‘Theatre by Candlelight’ which looked at the Sam Wanamaker Theatre and the use of candlelight in the space. I had no idea that the venue had an in-house Candle Technician! There were also some amazing case studies about various theatres from around the world – including the soon to be opened Shed in New York along with the National Theatre in London and Ottawa’s National Arts Centre. Whilst it’s important to discuss the future of theatre architecture, it’s just as vital to remember that ‘historic theatres are part of our cultural landscape’ – a comment made by Jon Morgan from the Theatres Trust. The final session featured Simon Harper hosting a “virtual dinner party” on stage inviting various people up to join him to discuss various issues that had come up over the previous three days – it was an interesting concept that worked well with some lively debate about a range of topics. This was followed by drinks & networking on the roof top terrace of the IET with its spectacular view up & down the Thames. 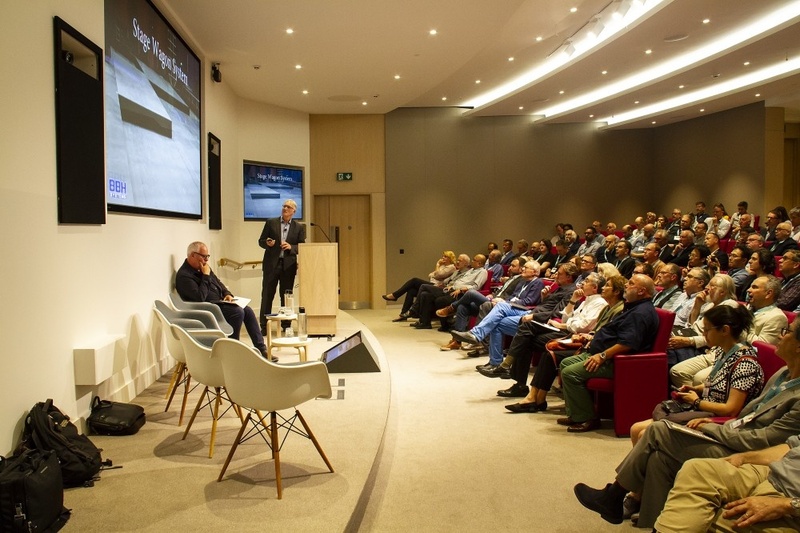 The IET proved to be a perfect venue for the conference and hopefully we can return there in four years’ time. To conclude, it was another fantastic conference which pushed thinking and discussion around theatres and how they are constructed. We were delighted to be a sponsor and want to say thank you to the organisers, especially Catherine Cooper, along with her many assistants which included our own apprentices. I would urge anyone to put the date in your diary for four years’ time. It would be great to get more people there who work in theatres on a day-to-day basis as producers, performers or technicians to make sure we are building the type of theatres that we need! Photos courtesy of Origin8 Photography.